We have all heard and met "sweet tooths", but have you met sweet fashion? Neither have I! 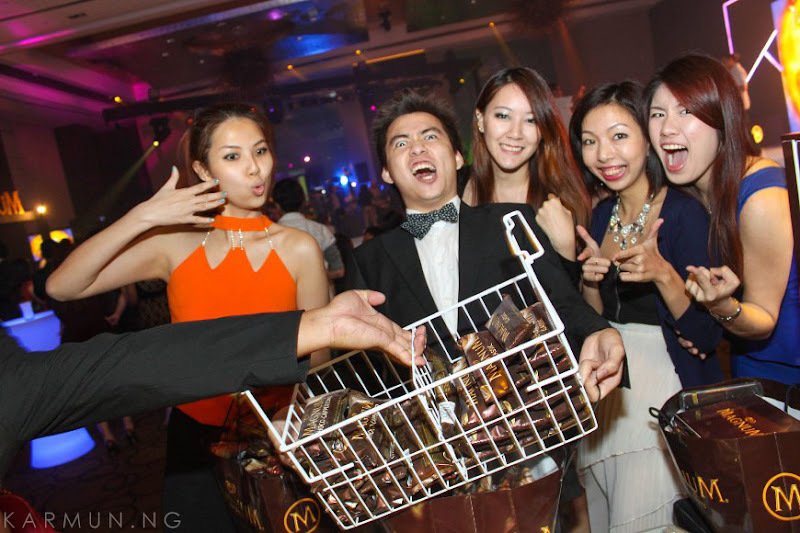 Not till on March 7, 2013 at the Grand Ballroom of Westin Hotel. 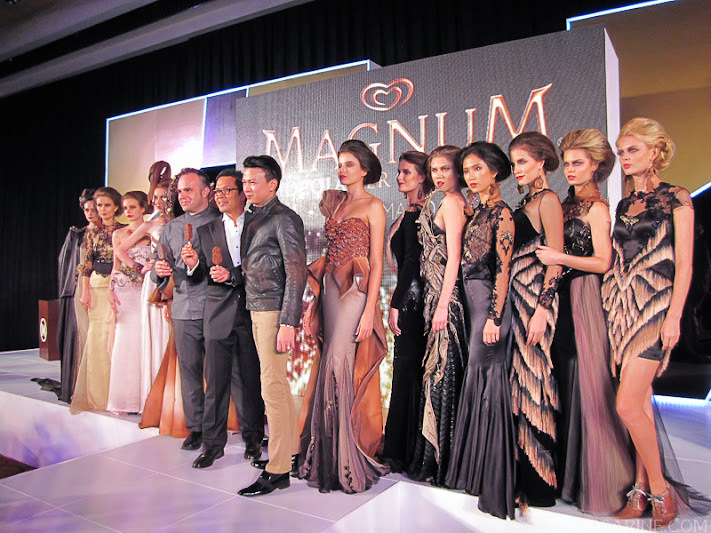 To celebrate the launch of the two new flavours: Magnum Chocolate Brownie and Magnum Strawberry, Magnum collaborated with local designer Jovian Mandagie to create a "Magnum Chocolatier Collection" that is made out of 100% pure Belgian Chocolate! 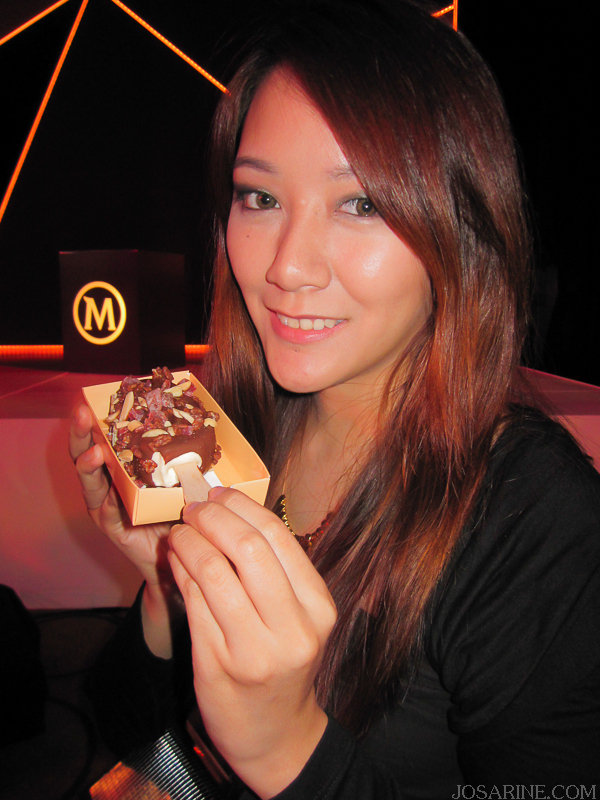 Magnum as most of us know is a premium ice cream that symbolizes luxury and pleasure. 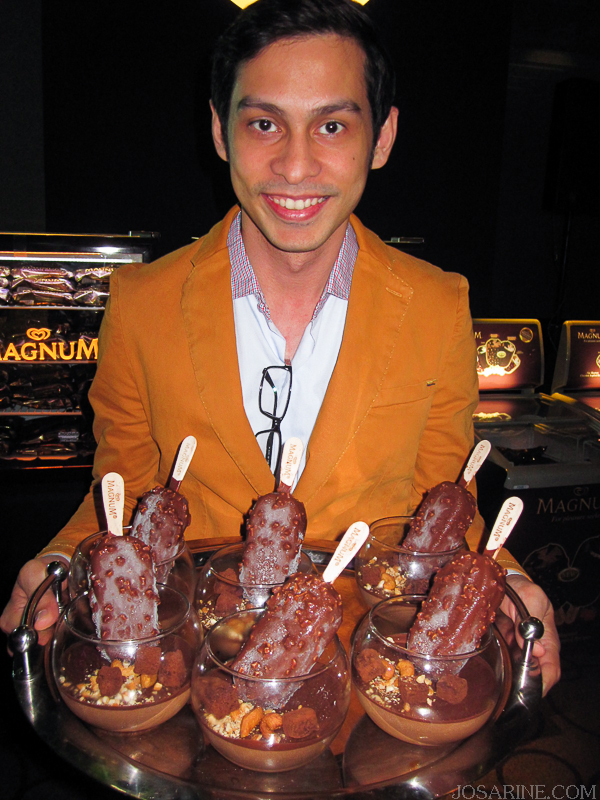 Herry Budiazhari, Marketing Director of Unilever Malaysia stated that "eating Magnum shoud be a pleasurable experience that can be enjoyed anytime and anywhere." I definitely agree with him on that. 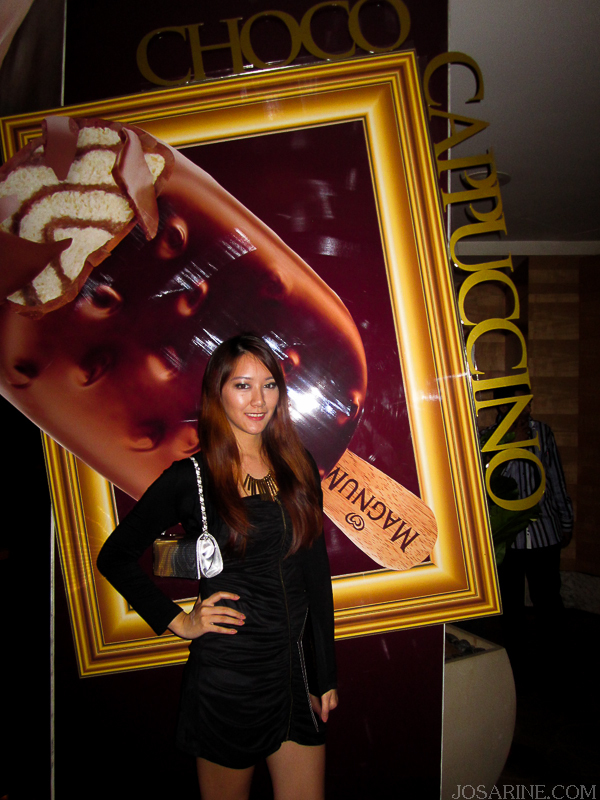 Yeap it is Choco Cappuccino behind me. 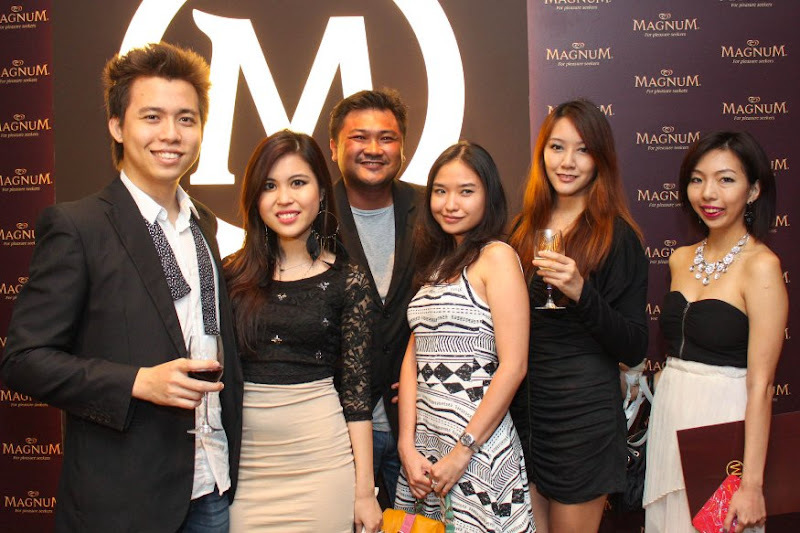 I've never knew Magnum has so many flavours until this very night. 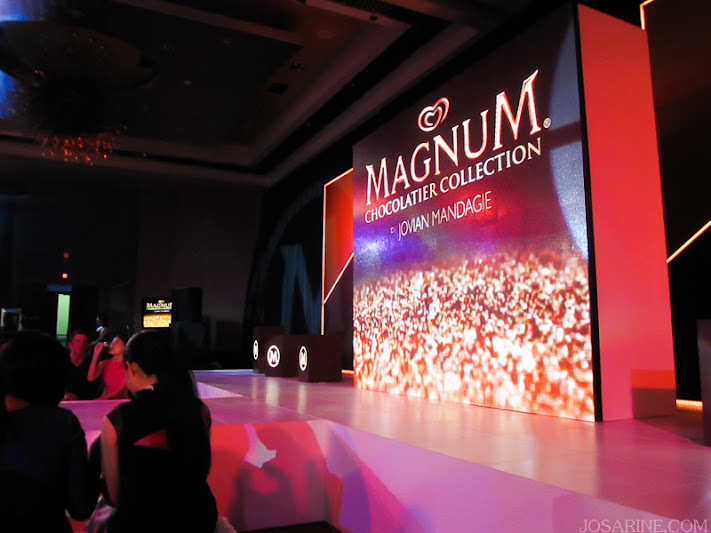 Other than the original Magnum called the Classic, there are a total of 6 flavours now: Almond, Chocolate Truffle, Choco Cappucino, and the two new flavours, Chocolate Brownie and Chocolate Strawberry. 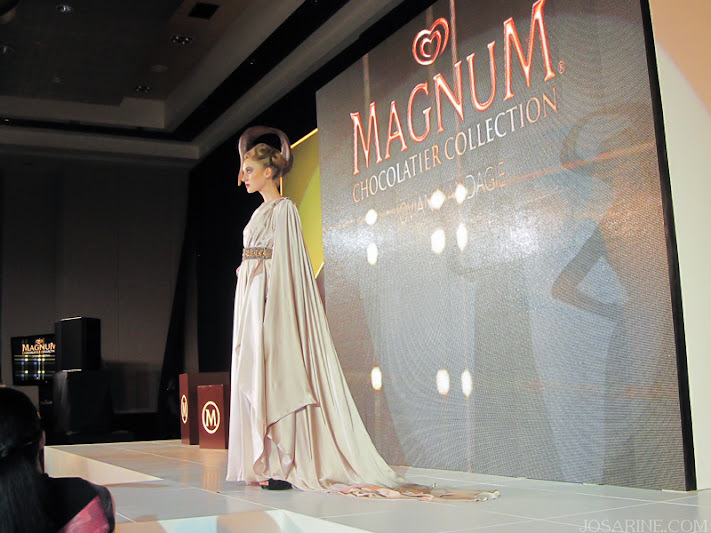 While thinking of ways to launch the two new flavours, Magnum wanted to take the pleasure of their chocolate experience to a whole new fashionista level. Not only are they good in giving pleasure to our taste buds but also in giving pleasure to our eyes! 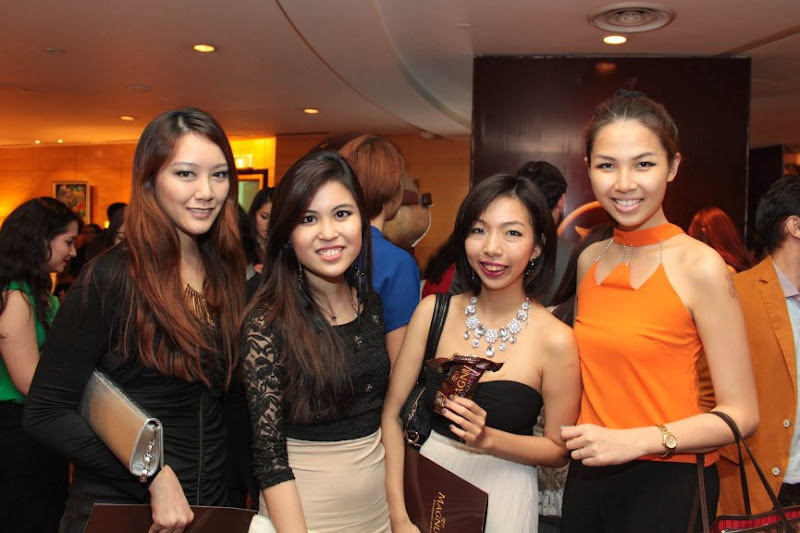 This would be the first EVER Belgian Chocolate Fashion Show in Malaysia! 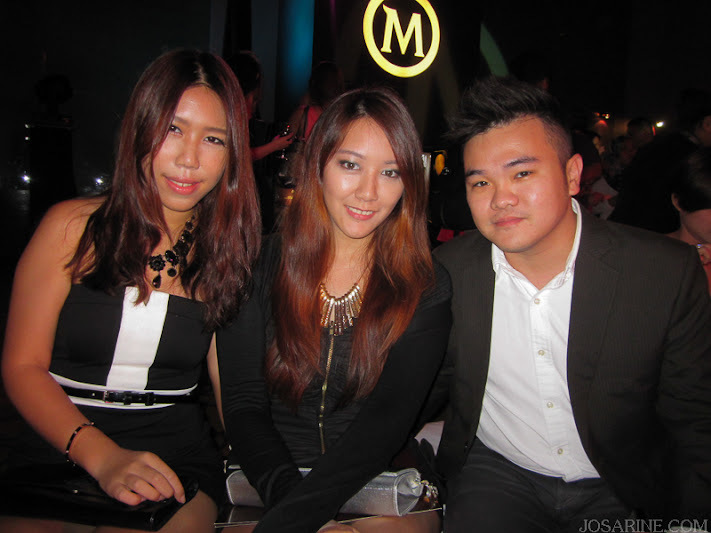 The designer for the fashion show is non other than as mentioned above, Jovian Mandagie. 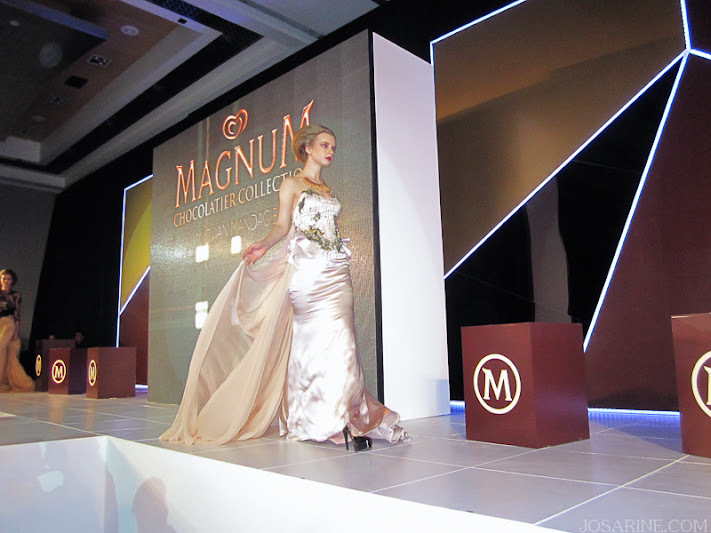 Models sashayed down the runway in mixed elegant couture evening gowns. Have you seen a pair of Chocolate earrings? Head accessories, neck accessories, even shoes are made out of Belgian Chocolate. 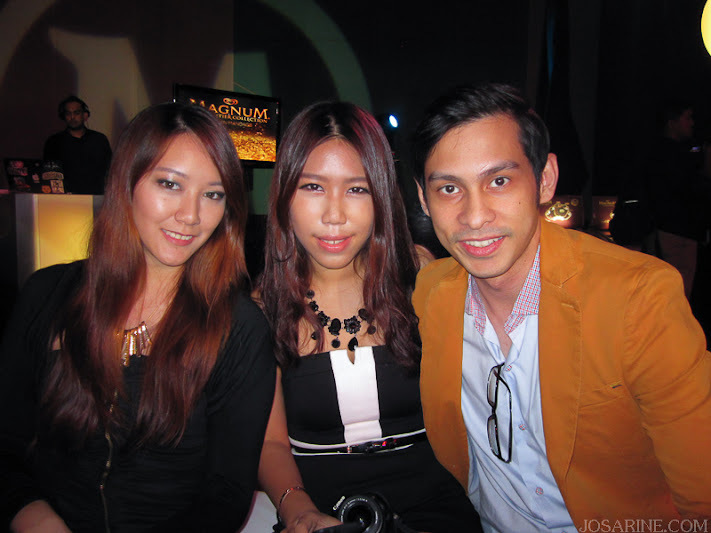 When designer, Jovian was approached by Magnum to do this, he immediately took the challenge. This was a whole new level for our local designer as he normally designs with fabrics like any other fashion designer. Despite that he has never done this before, Jovian was very excited to work and team up with Chef Christophe Morel and his team from The Academy of Pastry Arts Malaysia. 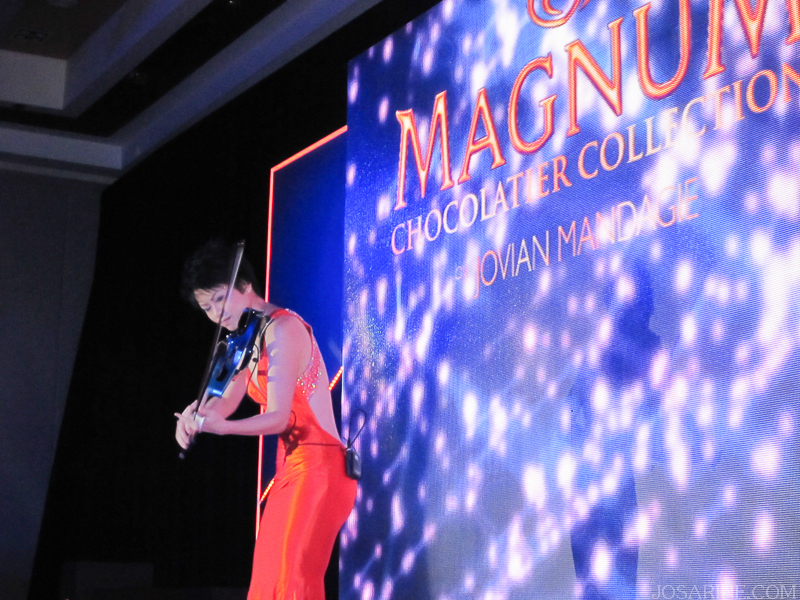 With their expertise in handling chocolate, Jovian and the academy were able to form silhouettes that other fabrics can't! Amazing isn't it? 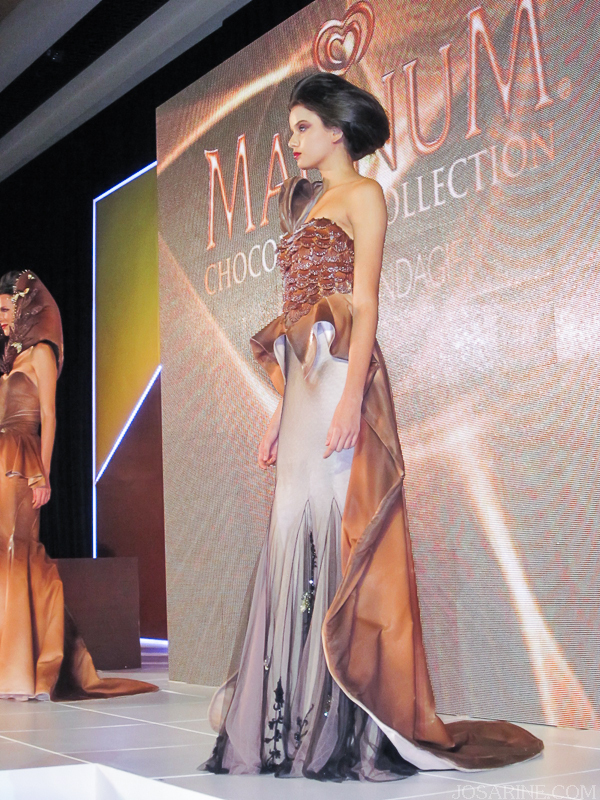 The long mermaid flared gowns, layered chocolate hood encrusted with Swarovski crystals to chocolate coated heels. 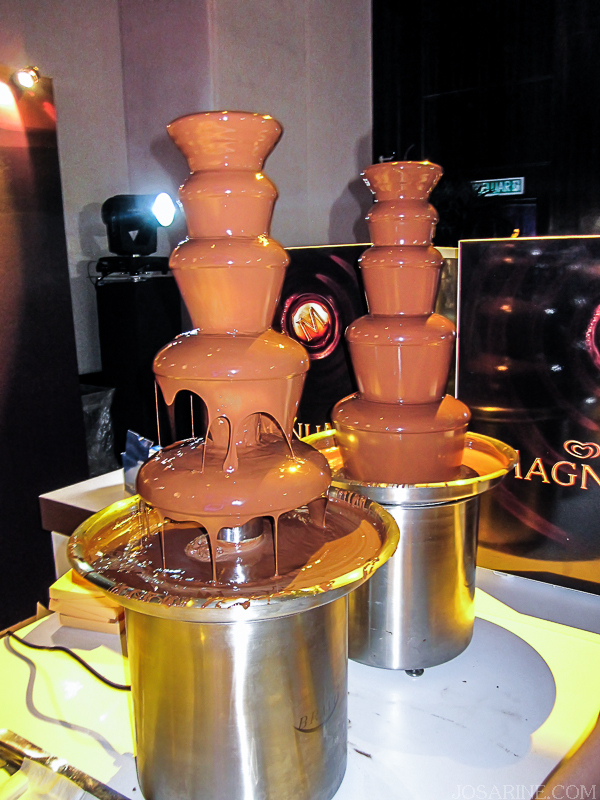 A total of 250kg chocolate and over 300 hours were put into this project just to mesmerize our senses. This would be one of the most amazing fashion show I've seen. 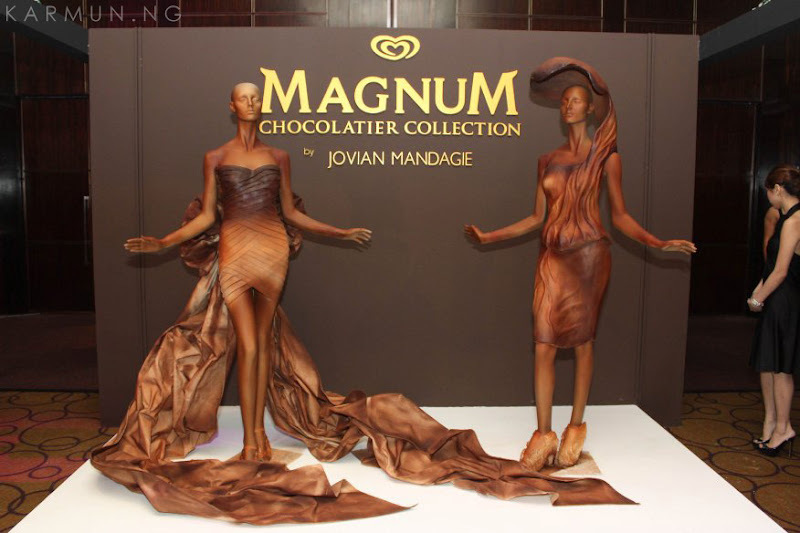 This was definitely not easy as they had to control the temperature of the room to prevent the chocolate from melting, carving and molding the designs on chocolate and not to forget transporting the chocolate dresses around town. Well this hard work paid off, the fashion show was amazing, and has wow-ed the public alright. 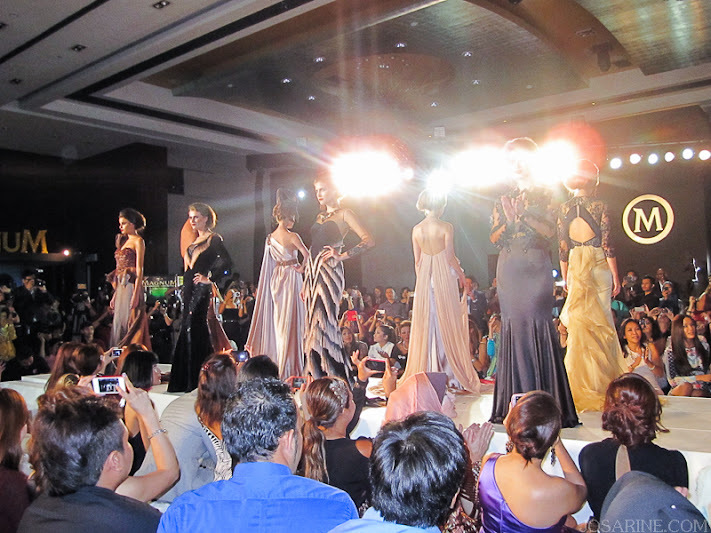 As the fashion show ended, crowd stood up and gave a round of applause to those who put a lot of effort into this. Again I say, this was the most amazing fashion show I've seen so far. 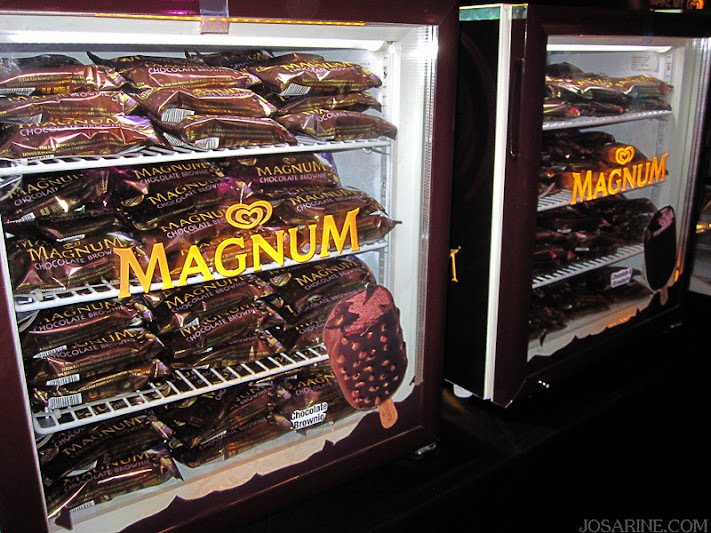 Make your own Magnum! We were able to coat our vanilla ice cream with as much or as a little (for those on diet) as we wanted as well with the toppings! These are the times where I would thank God for me not being a sweet tooth, or else I wouldn't be able to stop eating and grow fatter. Magnum ice creams were EVERYWHERE. When you feel like having one, just grab one. 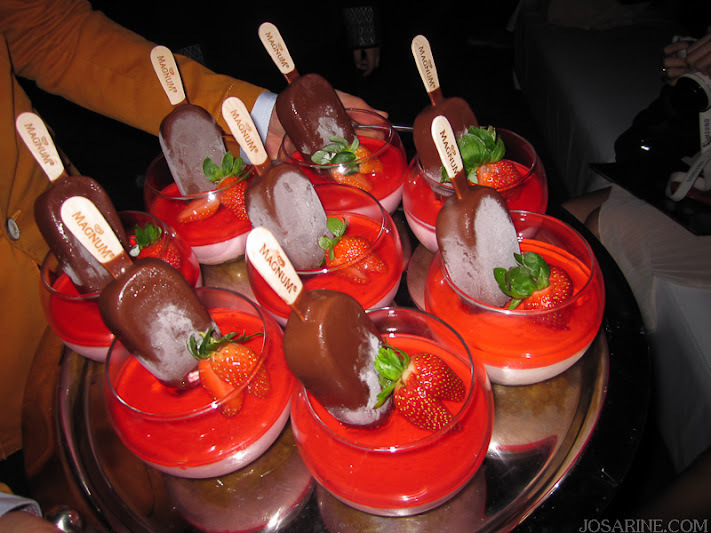 I got to say that I'm very proud of myself that night, I did not eat a single one! Well except for small little bites to taste, but that's it. 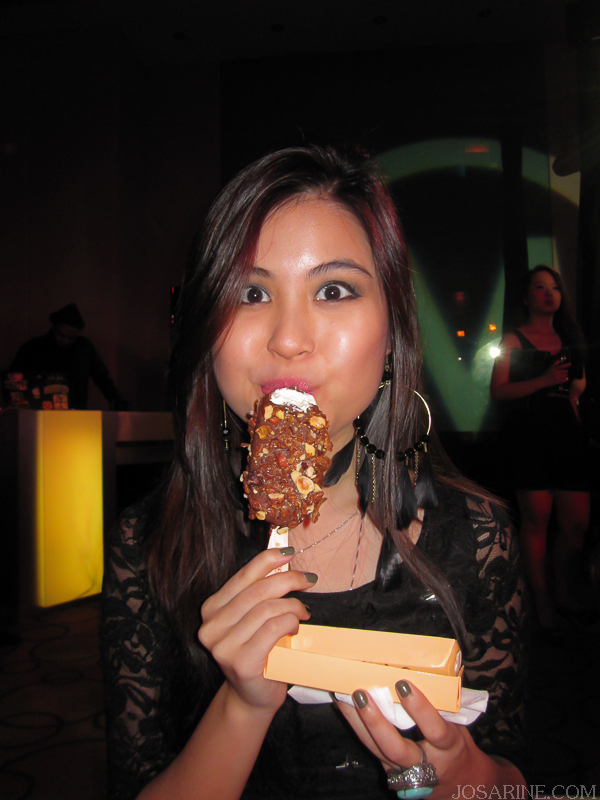 Karmun happily eating her Magnum. 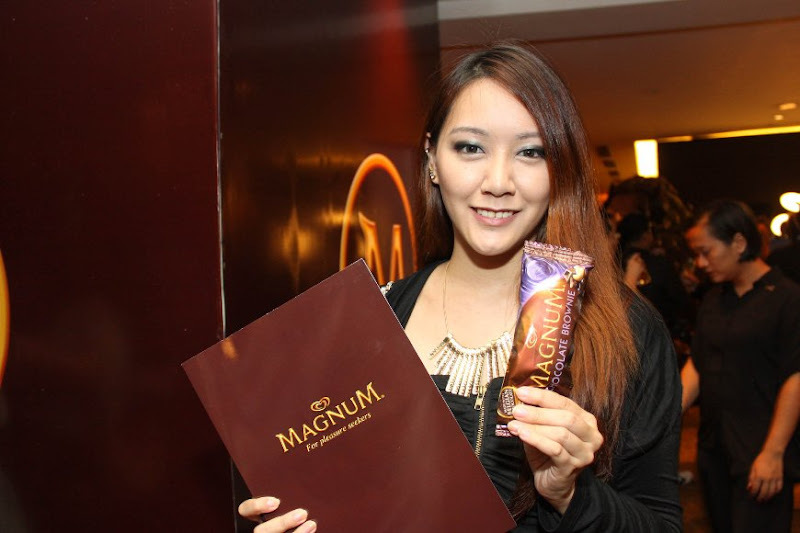 The two new flavours of the Magnum can be found at retails store at RM3.90.